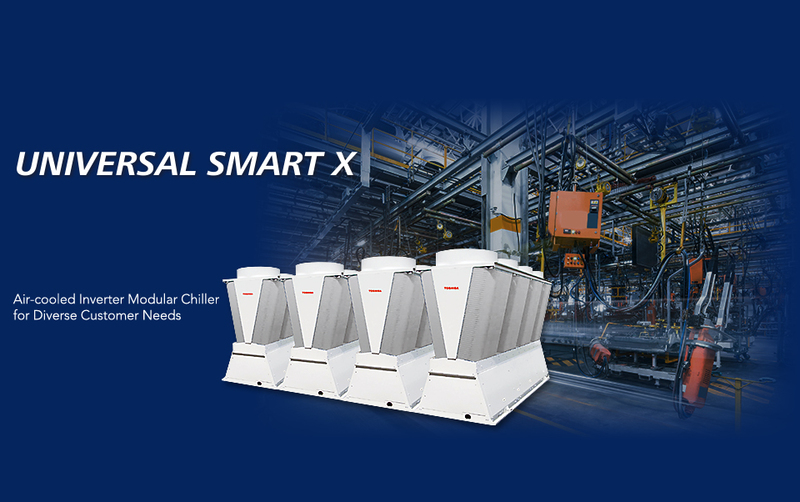 Universal Smart X —— an air cooled chiller system which achieved more energy savings through industry-leading operating efficiency and flexibility among wide-ranging temperature environments, from air conditioning to industrial processes. Thanks to the new DC twin rotary compressor, the UNIVERSAL SMART X series achieved further improvements to energy efficiency. The new compressor not only improves the motor but also reduces pressure loss. Excellent operating efficiency can be reached under both high and part loads. Otherwise, capable of wide capacity control allows the system to operate stably at very low loads. Each rotary compressor can decrease its capacity down to 20%. 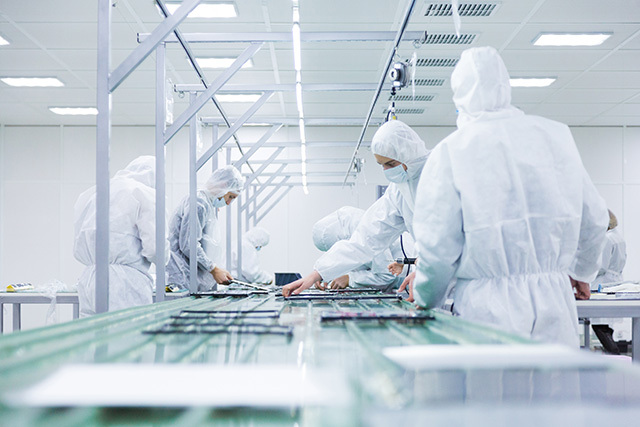 Together with no-of-compressors control, each modular unit can decrease its capacity down to 5%. Based on these advances, the new DC twin rotary compressor brings the highest level of IPLV7.1* in the industry! * For high EER type 30hp module unit, based on AHRI550-590. Excellent part loads performance is applicable to multiple unit system too. But like below to optimize efficiency using heat exchangers as much as possible. * Example for the system with ten 50HP module units. Optimum air flow with advanced X frame. Easy installation in small spaces. 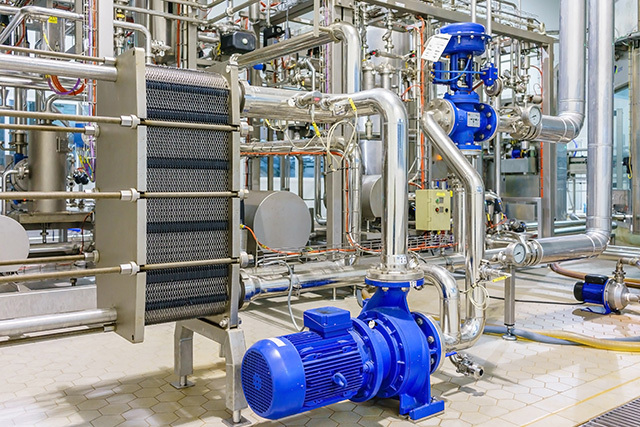 Installation space has decreased by 58% compared with the conventional chillers, providing enough capacity increase in the same space. Space-saving design makes an easy replacement from a system using a cooling tower. * Compared with the space needed to install a system for a 1200kW cooling load. Adopting UNIVERSAL SMART X modular type chiller can avoid risk of system shut down or sharp capacity decrease at the time of unit trouble or maintenance work. Furthermore, capacity drop risk can be minimized because each module unit has four independent refrigerant circuits. In addition to the operating control through the water temperature detection in the original model, new operating control via flow rate detection was added to make the bypass flow approach just about to"0". Contribute to energy-savings for both heat source machine and entire system. Transport power is greatly reduced through control coordinated with the load! Electrical harmonic current suppression function comes as standard. Not only reduced costs by eliminating additional installation for the harmonic current suppression, but also brought power factor up to 99%. 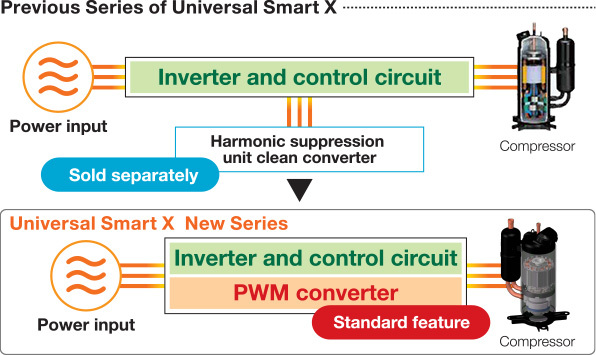 Up to 128 UNIVERSAL SMART X module units can be combined and operated together. Module controller, group controller, and Web monitor are now ready for users to manage and save energy. For example, you can even monitor the following! Wireless LAN function comes standard in the module controller. Dedicated application collects data, like power consumption and inlet/outlet temperature, on a device, like a tablet, allowing for the study of optimal operations. * The machine is not designed for use in all regions. Please contact a representative for details. Combined module units minimize the installation restrictions, and eliminate any issues with installation space. 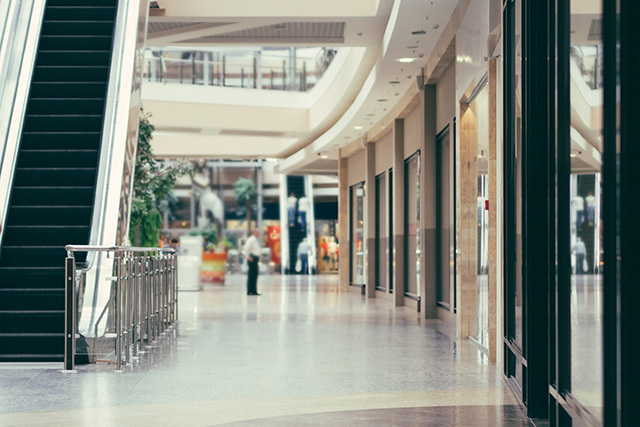 The products or features may not be available in your country. Please refer to your local website for details if it is available in your country.